Will you be at ISA in Las Vegas this week? If so, you’ll want to stop by and see us because we have some exciting news to share with you! But first you have to find us. We’ll be exhibiting in Booth 5992 thanks to our friends at CET Color. Just look for the lightbooth and we will be right there. Take home a free lightbooth! Speaking of the lightbooth, it’s a 13” x 19.3” model PDV-2e from our friends at GTI Graphic Technology. And get this: We are giving it away at ISA! ** Note: The lightbooth needs to be picked up between 3 and 4 p.m. on Saturday (the last hour of the show) unless other arrangements are made beforehand. Shipping is not included. Measure color on the go! 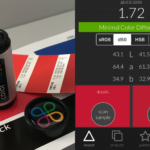 This week at ISA, we will be introducing ColorMetrix Mobile. It’s powered by a small measuring instrument from our friends at MeasureColor.mobi that you can fit in your pocket. It’s great for quick spot checks anywhere and educating folks about color difference measurements. Stop by and give it a try! The unit itself is only $59 and we have a limited number with us at the show that you can purchase on site. There is a free app for your smartphone available or if you want to import your own colors, you can subscribe to the full version of the app. The app and instrument can also be purchased online. (Please use our link so we get credit for the sale vs. buying directly on the MeasureColor.mobi site. We are excited for this week’s show! Please let us know if you’d like to schedule personal demonstrations of our software and services during ISA! Our CEO Jim Raffel will also be giving two presentations at the Lounge & Learn booth at ISA. Lounge & Learn sessions will be held in booth 332. Building Custom Profiles for UV Flat-Bed Printing Made Easy – Thursday, April 20, 1:45 – 2:15 p.m.
Building Custom Profiles for Dye Sublimation Printing Made Easy – Friday, April 21, 10:45 – 11:15 a.m. Check out the entire Lounge & Learn schedule.